Roman Catholic Baptism for adults and infants. Roman Catholic Baptism is for adults and for children, infant baptism. If you're studying about Baptism you'll be glad to know that the Baltimore Catechism teaches the Baptism catechism answers about Creation, Heaven, Hell, Original Sin, Death, and Purgatory concisely. Learn about the Baptism ceremony here. Baptism is your entry to the Catholic Faith. It is a rite of initiation, a new beginning, your ticket to Heaven. Either the long wait for Mamma's and baby's safe arrivals, or the sometimes equally long and hopeful study, necessary for the adult catechumen, are joyfully met in Baptism. Any beginning catechism will help you study for entering the Catholic Church. Actually, the simpler the better for making things clear. 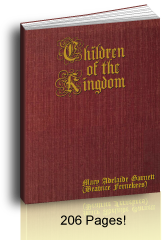 A child's catechism works for children, and is also a wonderful outline for adult converts. Adults will need only one large catechism. There are not really "levels" in a catechism. See what your pastor recommends. Order an audio catechism here. Adult Catholic Baptism: Welcome to the Catholic Church! The better you prepare spiritually for receiving any sacrament, the better chance you will have of having the great grace of Final Perseverance which means getting to Heaven. It doesn't matter with Baptism though. You'll receive the whole "kit and caboodle". Original sin and all your sins will be washed away. Grace is effective. On the other hand the better you prepare with prayer and conversion of life, the better habits you'll have to keep the grace of your Baptism afterward. Pray and God will help you. Be sure to form a good habit of saying the daily Rosary and you'll know most of the basic Catholic prayers. Baptism is the gateway to eternal happiness in Heaven. It gives you the treasure beyond price of which Jesus Christ spoke in the Gospels. What does Baptism mean? It means that you now have the right to go to Heaven if you do not commit any sins. Purgatory is your back-up with the end being Heaven. If you're an adult studying to become Catholic, you have my sincere prayers for a joyful life and final perseverance in the one thing necessary - reaching Heaven. My husband is a convert and we are so glad we have a good Catholic family. We're a happy family because of the sacraments, prayers, and trying to "the better thing". Baptism is the most important Catholic sacrament. You receive it first before you can receive the other sacraments. Without baptism, in fact, in desire or by martyrdom, you cannot enter Heaven. What's necessary? In an emergency, not much; yet when you have time to prepare, prayer and study are necessary. This way you learn what your new responsibilities will be and have the grace of God to help you persevere after Baptism. You can learn more about the preparation, prayers, and full ceremony on our Catholic Baptism ceremony page. First, pray. Ask God for direction. He'll send it. Usually there are a few books your pastor would like you to read. You'll want to learn a certain amount from the catechism and read a good spiritual book. I found that it was very helpful in my life to read saint books. Is it easy to learn what needs to be learned? Yes. The main things you'll study are the Catholic Ten Commandments, the Catholic prayers, and saints stories - which most Catholic children learn by the age of seven. Why read about the saints? When you are Baptized you take a saint name for your baptismal name, so that you have another patron in Heaven praying for you. Ask your pastor or friends in the faith which saints names they recommend and read a few stories about those saints, so that you choose one with which you identify. You'll make frequent prayers to your saint throughout your life. This saint will become a new life time friend, so it's good to get to know your saint first. What is there to be learned in order to be Catholic? This page on being Catholic has a short overview that keeps union with Jesus and happiness in Heaven as your number one goal. Many Catholic answers that are omitted in republished catechisms are covered on our Catholic answers page. Many books sold as catechisms have removed principle doctrines like God's creation, so beware the books you choose. So many times we've learned about the faith on our own and are received into the Church on our own. This is so admirable! By the time we are ready for Baptism we have made Catholic friends and have asked another Catholic to show us where to go and what to do, and this dear friend quite often becomes our sponsor or Godparent. If you do not know someone to ask to be your sponsor, Father can recommend someone for you. He knows who the generous, faithful, and friendly practicing Catholics are and which would be a good match for you. As with my husband, he chose members of my family for his Godparents and we have all been lifelong friends ever since. The grace of being Catholic is the cause of the happiness in our family, and we hope the same for you. Other times we are already married and have children when we come to the faith. First, any infants can be Baptized right away, yet the rest of your family who are over the age of reason (usually 7) will study the main tenants of the faith and spend time preparing. Father will direct you as to what to do. Mainly there are short catechism books for you to read and a series of adult Catholic Baptism classes to attend. If there are others in your class, you're likely to become good friends; if not, you benefit by having Father's undivided attention. Sometimes there are separate instructions for your children, yet you might also be able to request to be taught as a family. If you're learning about the Catholic Faith as a family and you have young children, they will love these coloring pages. The first one is sweet for preschool and kindergarten ages and the other is beautiful for older children. Print these with your printer's booklet setting to make a Baptism card. 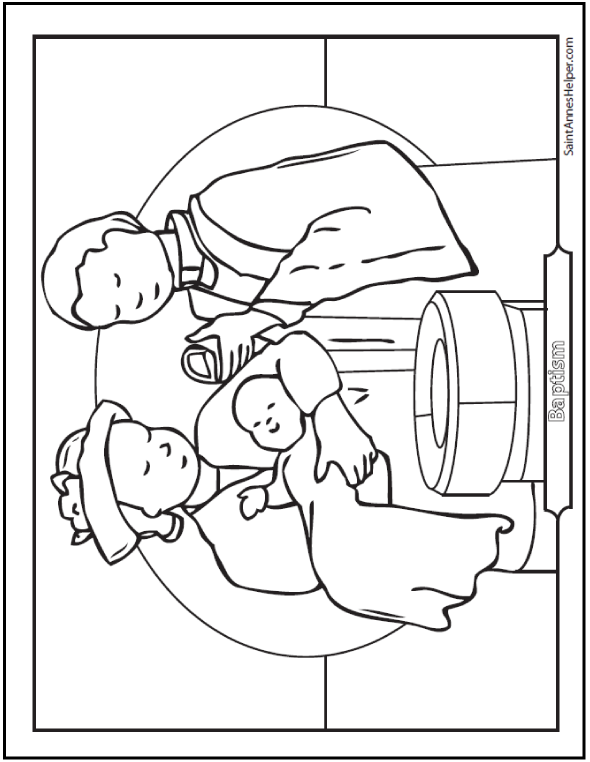 Baptism Coloring Sheet: Simple coloring page of the sacrament of Baptism with priest, infant, and Godmother at the baptismal font. 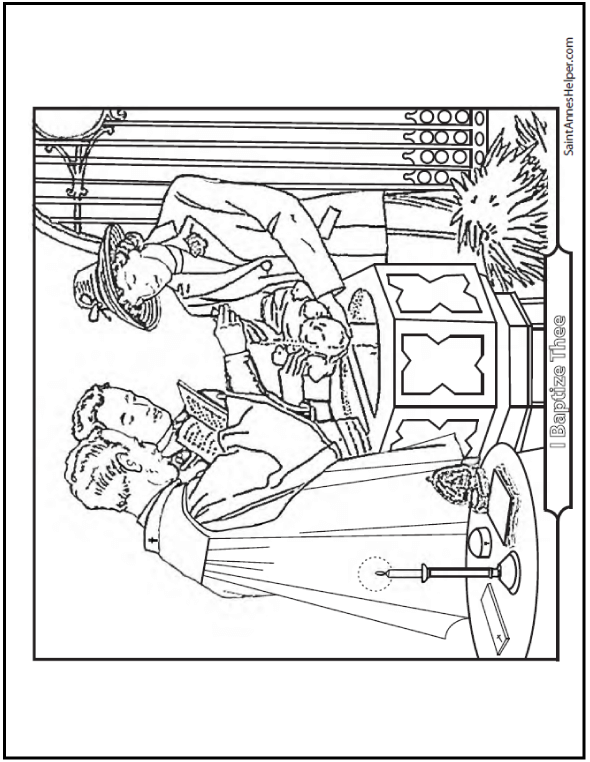 Beautiful Baptism Coloring Page: Priest, Godparents, and infant at the baptismal font in the Baptistry with Baptism candle, etc. Books are always welcome. You'll want to learn more about the spiritual life or the history of the Church and her saints, so books are excellent to suggest. In preparing for Baptism Catholic families try to make sure that the ceremony is performed as soon as possible after Baby is born. Leave any plans for extensive Baptism invitations, Baptism party, and Catholic Baptism gifts for later when Mom and baby are ready for the extra attention. 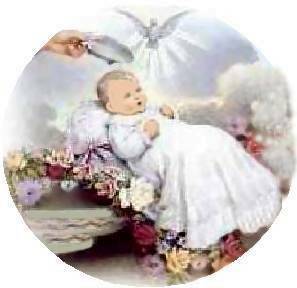 You can find many good ideas about preparing for a Catholic Baptism ceremony here. "Baptism is the sacrament which cleanses us from Original Sin, makes us Christians, children of God, and heirs of Heaven." What are some other topics you'll study? Simply, to understand the Baptism catechism answers, one must understand that God created Heaven and earth (the very first words of the Douay-Rheims Bible, Gen 1:1). He created Heaven for the angels and for us. The bad angels were cast into Hell. Adam and Eve listened to their leader, Lucifer, and committed the Original Sin by which Death entered the world. Original Sin is the reason that we need Baptism. "Original Sin is the sin we inherit from our first parents, Adam and Eve." God promised Jesus Christ to them through the Blessed Virgin Mary (Gen 3:15) to offer them hope for themselves and for their many children. In due time when Jesus came He instituted the Catholic Sacrament of Baptism by which Original Sin is taken away. 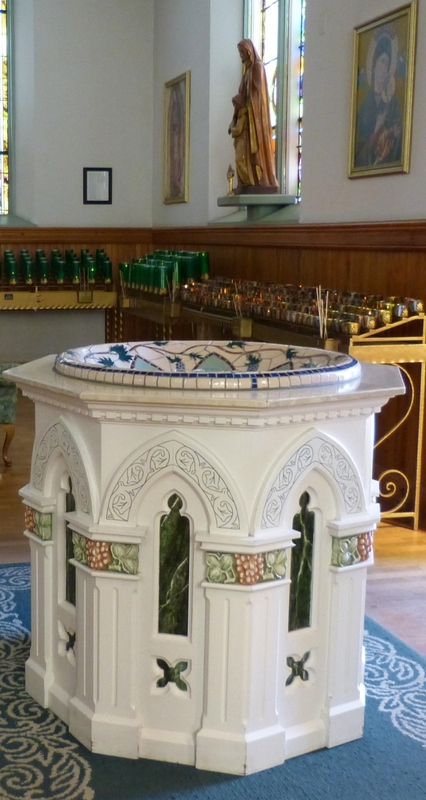 Those who are baptized and commit venial sins will avoid going to Hell, but may suffer the fires of Purgatory if they do not go to Confession and do penance for their sins. What is sin? Sin is disobedience to God's Laws. What are God's Laws? God's Laws are the Catholic Ten Commandments. This is actually how simple the moral order is. God showed us what He wants and told us what not to do. See more about the Ten Commandments here. Parents can choose baby's name from the many saints' names available in the Catholic saints list in many books like Is it a Saint's Name? published by Tan Books. Early in our marriage, we didn't realize that choosing patron saint's name from a Catholic liturgical calendar made the search easier. 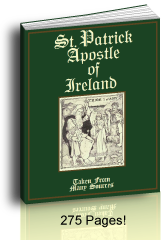 There are great books on the subject of Catholic saints names and they also have lists of patron saints names. Some Catholic calendars have patron saints lists in them, too. Many parents name their children according to the saint of the day that they were born. We had already known about choosing Roman Catholic saints from a favorite devotion to a particular saint. This was the major factor in the choice of the names of our first four children. They were named for our favorite saints at the time. A great list, too, was our list of honorable relatives and friends if they had Catholic saints names, especially the probable Godparents. Using patron saints names for Baptismal names affords that saint's protection and this is why such names as Mary, Joseph, Michael, and John are such popular names, they are patrons of so many Catholic themes. Is It A Catholic Saints' Name? We soon ran out of our own favorite baby names. Thank God one of our best friends had given us the Is it a Saint's Name? booklet as one of our favorite maternity gifts. 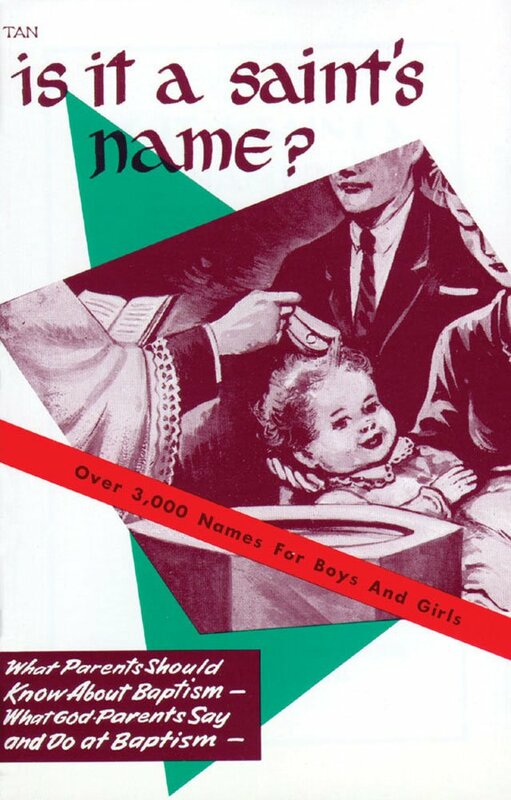 It has very good advice about choosing names as well as the basic rite of the Catholic Baptism ceremony in an emergency and can be found at Tan Books. It also has a list of patron saints. There's another baby name page at Catholicity for extra ideas! 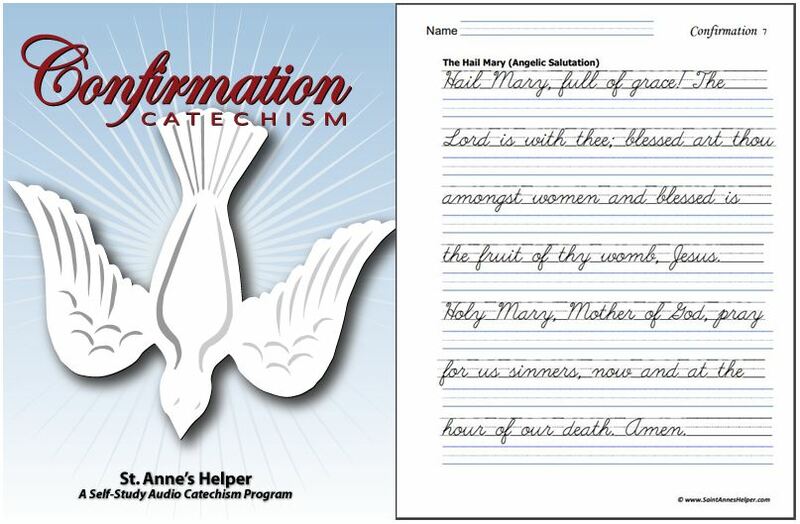 St. Anne's Helper Audio Baltimore Catechisms for First Communion and Confirmation make excellent Baptism gifts since they will teach the truths necessary for your family and friends to keep the Faith. Adult converts are grateful to have an easy way to review the basic Catholic beliefs. Once they have already studied this material they can receive all three sacraments on the very same day, so one would want to give these CDs early since they help prepare for Baptism, too. New babies, on the other hand, have all of their study ahead of them, so our St. Anne's Helper Catholic audio books are a great gift from Grandparents and Godparents. They make it easy for the parents to teach the Faith when the time comes. There are many truths to learn about the Catholic religion that make going to Heaven easier. Godparents can give a sure opportunity for baby to learn the Faith when they give the family an audio catechism either at the Baptism or later when the child is ready to study. Parents are thrilled to find such easy help with teaching the Faith as in this version of the Baltimore Catechism, especially for homeschool. They frequently learn or relearn right along with their children. We know many who did! 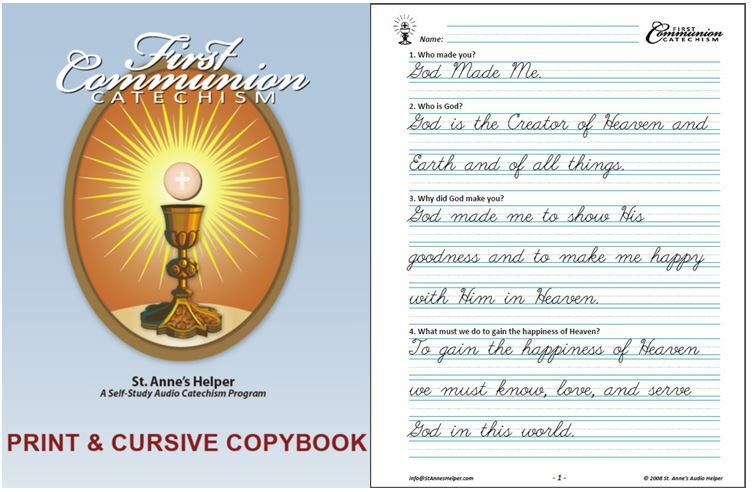 We now have many other products that are super helpful for those new to the Catholic Faith and to homeschooling parents like our printable worksheets and coloring pages. Books about the lives of the saints. NB: This answer has been taught throughout the history of the Catholic Church. It is important to note that many catechisms of the last one hundred years do not explicitly teach that Baptism takes away Original Sin. St. Anne's Helper Catholic audio books and Catholic ebooks do! See what Thomas Szyszkiewicz wrote of the opinion of the USCCB at Catholic Parents Online of many of today's catechisms here. It sure shows the need to choose your catechism well when preparing for a Roman Catholic Baptism. Delay of this first sacrament is eternally dangerous. Be encouraged to set your mind and your heart on God, so that you are not distracted from the One Thing Necessary. Roman Catholic Baptism and saint names.